I can’t even tell you how excited we are about our kitchen renovation reveal and how well it turned out! And I’m even more excited to share our process and how we got here. Because it definitely didn’t always look this pretty. Our kitchen renovation was a long time in the making. So to say we finally have a fully functioning, updated, BEAUTIFUL kitchen is such a dream. Without further adieu, let’s dive right in to the before and after. Here’s what the kitchen looked like before. This was taken during the process of painting our cabinets, hence a few of the cabinet doors removed, which we did a few months after moving in. After we painted our kitchen cabinets a pretty blue, it looked like this. We painted to get rid of the terrible orangey cabinets and it looked better. But at this point we still had linoleum floors and counters and the old, original appliances. While we knew we wanted to renovate the kitchen eventually, it wasn’t in the budget to do it right away. There wasn’t really a set plan we decided on where we’d renovate “next year” or anything like that. It came down to when we had the time (and knowledge) to do it ourselves once we saved enough and felt ready to tackle it. Since we cook a lot and hardly ever eat out, we’re always in the kitchen, but it just wasn’t an inspiring space to hang out. The oven was so small with only one rack, and the stove top was old and the knobs were wearing off so you couldn’t see the burner temperatures. Not only was the kitchen really ugly, but the appliances didn’t work that great either. After 3 (!!!!) years of living in our home, we finally tackled the kitchen renovation this past summer. It was kind of a last minute decision, actually. We had talked about starting within the year, but to make it even more stressful, we decided to start the reno just a a couple months before our wedding! Because why not ha. Nothing like a hard deadline to get everything finished in time! Excited doesn’t even BEGIN to express how happy I was to rip out the out-dated kitchen. But first, let’s talk designs. As the type A planner that I am, I had our design plan figured out well before we actually started demo. We weren’t adding on or changing the footprint of our kitchen, but we’d be updating counters, floors, hardware, lighting, backsplash, appliances, and cabinets. The overall vibe I wanted for the kitchen is the same as the rest of our house: light, airy, cozy with a mix of rustic + modern elements. To figure out what we wanted for cabinets and counters and all the other details, I did some research, of course spent time on Pinterest pinning ideas, and then created a mood board so I had a visual of what all the elements looked like together, creating my design plan. If you want a more in-depth look at how I research, look for ideas, and then decide what colors, furniture, and other things I want to incorporate in my room, read this blog post. When we put in our wood floors in the living room over a year ago, we purchased enough for the kitchen, knowing we were updating those floors at some point too, so we had the flooring already figured out. Learn how to create a mood board here, like the one I made pictured above. We did white subway tile in our bathroom, so I wanted white subway tile backsplash in our kitchen. I’m a big fan of classic backsplash that you won’t tire of after a few years. Subway tile is always a practical yet beautiful option. For counters, it was between white quartz or butcher block. Quartz counters were over double the cost of butcher block, so that’s ultimately why we chose wood counters. While I do love the look of butcher block, this isn’t our forever home so we didn’t want to spend more than what we’d actually get back when we decide to sell, so butcher block made sense. They do require a little more maintenance, so that’s something to keep in mind. I researched how to care for butcher block a ton and found that with a little extra care and some mineral oil, they will hold up for years. We obviously had to get a new range, but we also were installing a dishwasher (finally!! ), getting a new microwave that mounted above the range to allow for more counter space, and a new fridge. I like the look of stainless steel so that’s what we went with. Usually you can get a discount if you buy appliances in a bundle package which is what we did at Nebraska Furniture Mart. On to kitchen cabinets…our biggest dilemma. While I love the blue cabinets we had, I wanted our new cabinets to be more neutral. We went back and forth on whether we’d keep the current cabinets and just paint them, or if we’d get all new cabinets. Ideally, I wanted new cabinets. We’d have to rip out the whole wall of cabinets where the old oven and stovetop are, which meant we’d have to install new cabinets on that wall to replace them. But I couldn’t find any stock cabinets available that matched our current size. It would look odd to have mismatched cabinets on one side of the kitchen, so replacing them all sounded like the best option. The old cabinet shelves also weren’t adjustable and didn’t have a tall enough clearance for things like a canister of oatmeal, so that was another bonus of new cabinets. To see how much new cabinets would cost, we got a quote from a semi-custom cabinet company and were shocked at how much it cost. They always say new cabinets are expensive and they aren’t kidding. And we don’t even have a ton of cabinet space! I tried to reach out to the cabinet company and see where we could make a few adjustments (I wanted some open shelving) to maybe lower the cost a bit, but they were horrible about getting back to me so after the bad customer service, we nixed that idea. They did provide a handy blueprint we were able to work off of and check prices for stock cabinets at Home Depot. Home Depot cabinets ended up being one fifth of the cost, plus there was no lead time (we only had to order a couple cabinets online, the rest were in stock in our local store). These are the pre-assembled shaker cabinets at Home Depot we went with. The main concern we had with the Home Depot stock cabinets was quality. If you read the reviews online, they are not great. Most of the them said they were cheaply made and arrived broken in some way. Ugh. I went to our store to check them out myself first hand, and after looking, I thought they looked pretty nice and the quality seems like it’d work fine for us. They were available in either white or a light grey, but the white had a different front door style I didn’t like, so we went with grey, which I initially wanted anyway. Jordon and I decided these cabinets were the best solution for us, so we went for it! We picked up all the cabinets in-store, and only had to order 2 that weren’t in stock. At this point, we had a garage full of cabinets, appliances ordered, and all other design selections finalized. We were ready for demo! Jordon was eager to rip out cabinets, so I emptied them and packed everything up. He started ripping stuff out one day while I was at work. Nothing like getting texts of your newly gutted kitchen while you’re away! We did keep the refrigerator as long as we could so we at least had some food for the time being. We resorted to plugging in the microwave in the living room so we could still make oats and other simple foods during the 5 week kitchen renovation. It’s always nerve-racking on demo day because you never know exactly what you’ll uncover. We lucked out and everything was pretty normal, except, after ripping out the stovetop and lower cabinets, we discovered there was a vent that came up from the furnace that out-jetted from the wall. Right where we planned on placing a 12 inch wide cabinet wasn’t going to work anymore, because we needed a wider cabinet to be able to cut the back of it in order to fit over the vent. We were forced to switch the cabinet layout a bit which was a bummer. I planned on adding open shelving around the range, but that had to change and then we could no longer have cabinets on both sides of the range either. But, there was no other options. Switching around the layout a couple times caused us to have to return a couple cabinets and order a couple new ones. This ended up setting us back a couple days because we were waiting for the new cabinets to arrive. All of our cabinets were in good shape, but we did have one that arrived a little broken. Luckily, it was only broken in the back and we were able to salvage it since, we didn’t have time to wait a week for a new one to come in. One other fix we had to do was add a different electrical plug to fit the new range and wire the microwave so it was on a different circuit line. Jordon was somehow able to install all the cabinets himself, leveling them and securing them to the wall. Once the cabinets were in, we could start on the wood flooring. Installing the wood floors took a few days with all the measuring and cutting. When the floors were in, we were ready for the appliances delivery. This was an exciting day! Our kitchen would finally be somewhat useable again. I was ready to have a stove back so we could stop eating microwave foods. Surprisingly, we didn’t eat out once during the week in the 5 weeks without a stove. It was just lots of cereal, sandwiches and oatmeal. However, we ran into an issue when the appliances arrived. When we picked out appliances, we made sure the size fit within the cabinet space, but we forgot to account for the doorway leading into the kitchen. Oops! The guys dropped off the appliances but the fridge didn’t fit through the living room/kitchen doorway. We ended up having to remove the doors from the new fridge, and even remove part of the molding on the door frame to just barely able to squeeze it by, with only centimeters to give. With the appliances finally installed, we could start on the countertops. We bought slabs of butcher block from Menards and cut them to fit. I researched a ton on how to seal the wood and found two options. Use a food grade sealer or use natural with mineral oil. Using a heavy duty wood sealer would protect the wood better longer term, but the sealer also changed the color of the wood and made it much more orangey than I liked. So I decided that applying mineral oil every few months was the best option for us. I may do an entire blog post on how we care for our butcher block counters, so if that’s something you want to see for sure, let me know! In between the big projects happening, we also finished things like repainting the walls, painting all the kitchen trim, and I painted the side entrance door the same blue we actually had on our previous cabinets. Once the counters were in, we were in the home stretch and could finally see the light at the end of the tunnel! Up next was tiling the backsplash, installing kitchen cabinet hardware, hanging window treatments and the new chandelier. We used our existing kitchen table and chairs and installed a really fun orb chandelier from West Elm which adds a nice modern touch. One unique piece we had made for our kitchen is the metal shelf. Since we were limited to open shelving on just the one side with the issue we discovered during demolition, I debated what I wanted to use for open shelving. At first, I was thinking open wood shelves, but I wanted to tie in the matte black accents from the chandelier and door knobs. Then, I had the idea for a black metal shelf. I sketched it up and a local welder from my hometown brought my vision to life! I love that it’s different and unique yet ties together the space perfectly. After 5ish weeks of work, we finished the kitchen renovation! And with enough time to spare before our wedding :) It was definitely a long few weeks living in a construction zone and spending every available minute on the kitchen. It was a lot of work, but we’re so happy with how it turned out! Every time I walk in our kitchen I’m amazed we tackled all of it ourselves and how good it looks! It’s truly looks just as I had imagined. If you are looking to refresh a room in your home, but you need a little help picking out furniture, colors, and decor, I can help! I offer room refresh services and can help design your room so you don’t spend hours and hours searching for ideas yourself. Click here for more info about my services. Do you have a room in your home you want to refresh? I’ll work with you 1 on 1 to create a design plan you love and pick out colors, furniture, and decor for your room. It' saves you hours of searching online and I’m there to help you make the right decisions (you won’t regret) so you can finally finish decorating! Click here to learn more about my services. As homeowners, it's important to us that we fix up our home and put our own touches on it to make it feel more like us. It's just as important that we make smart decisions and protect ourselves from anything that may go wrong. Because you know, life happens. If you're like me, choosing home insurance is confusing and overwhelming. Esurance helps you make smarter, more efficient choices with your insurance and takes the hassle out of it. How great is that?! If you're looking for ways to make smarter choices for your home, you can check out Esurance for more info. As we're coming up on 2017 (!!!!) and the 2 year anniversary of living in our first home, I wanted to do a year in review and recap the home projects we tackled this year. It's always fun to look back on how far we've come and remind ourselves of all the hard work we put into it. Our house is split-level, meaning you have to take the stairs to get to the main level of the house from the garage. With the stairs being such a focal point in the house, I wanted to update the old rubber and brown paint to something that fit with my style. We spruced up the stairs by painting them white and adding a new sisal runner. For the full tutorial on how we did it, click here. It was a fairly easy and affordable project that you can do in a weekend. It really made all the difference when you walk in the house and that's the first thing you see. The stairs look so much nicer and now they match the rest of the decor in the house. When we first moved into the house, I came up with a quick and cheap solution for our TV stand but was never really crazy about it. It didn't offer any storage and it looked small on the large wall. I love built-ins for the storage of course, but I also thought they would better fit the wall and create a nice focal point in our living room. 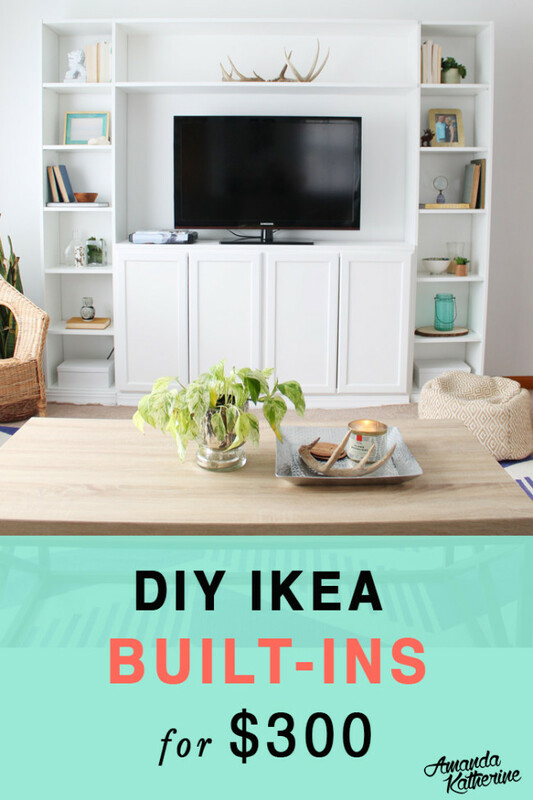 There are a variety of tutorials out there for DIY built-ins, but we decided to take the easier route and do an IKEA hack. Jordon is super handy, but I didn't think we should be building everything from scratch, including cabinet doors, because that just requires more time and work. After doing some research on IKEA hack built-ins, I ended up coming up with our own version. You can read the full tutorial here. We were able to make them for about $300 in one weekend. I'm super happy with how they turned out and love them just as much as when we installed them! They definitely create a focal point our living room needed. We made progress in the basement family room by moving our old couch down there, adding our cowhide rug, installing wall sconces, and Jordon made a beautiful sliding barn door TV stand. We'd still like to add a bar and some more decor to dress it up, but it's nice to have the extra space for guests. We finally bit the bullet and replaced the dingy old carpet throughout our home with wood flooring. You can read all about why we decided to go with engineered wood floors here. This might be my favorite update we did this year. The new flooring totally modernized the home and it looks so much better! Love love love the floors we chose. In addition to the new floors, our living room got several more updates. We got a new couch, lighting, blinds, and rug. It's a whole new space! This new design fits my style and functions much better than what we had previously. You can find sources to everything and read about the living room transformation here. Next on our list to tackle in 2017 is the kitchen. This will be a bigger renovation and we will be doing a lot of it ourselves to keep costs down. For the design, I'm envisioning white subway tile backsplash, butcher block counters, and a new dishwasher and stove and we'll continue the wood flooring into the kitchen. Our bedroom is almooooost finished and I will be sharing it in a month or so. I took a break from decorating the bedroom when I was working on the living room so I'm excited to get our room finished. I found the perfect sconces and we finally got them hung up a couple weeks ago and now I'm just picking out some wall art. Stay tuned for the reveal soon! I'm so happy with our progress we've made on our home this year. It really feels like us. If you're looking for ways to make smarter choices for your home, check out Esurance. They make insurance simple and hassle-free. This post is in partnership with Esurance. Thank you for supporting the brands that help make this blog possible. The past several months I've been busy working on a living room makeover. It all started last year when I had a mindset shift regarding decorating. We were about a year in our new home and I was tired of a lot of things. I was tired of spending hours decorating, trying to make it perfect and failing miserably. I was tired of spending lots of money of decor, only to have it shoved in a closet a few months later because I didn't like it. I was tired of not feeling happy or proud of our home and the way it looked. So I decided to do something about it and I came up with my own take on capsule wardrobes after experimenting with them, except for the home. If you aren't familiar with capsules, the main principles are buying only select items you love that work well with your lifestyle and combine to create a cohesive wardrobe, or in this case, home. As a result, you spend less time and money and have a home you love. With my new outlook on decorating, I set out to redecorate our living room following this new capsule system that I created. The system consisted of finding your signature style first, and then putting together an entire plan decorating BEFORE buying anything. The focused plan I put together was the winning difference between just another failed attempt at decorating our living room and actually creating a space I love that fits us. 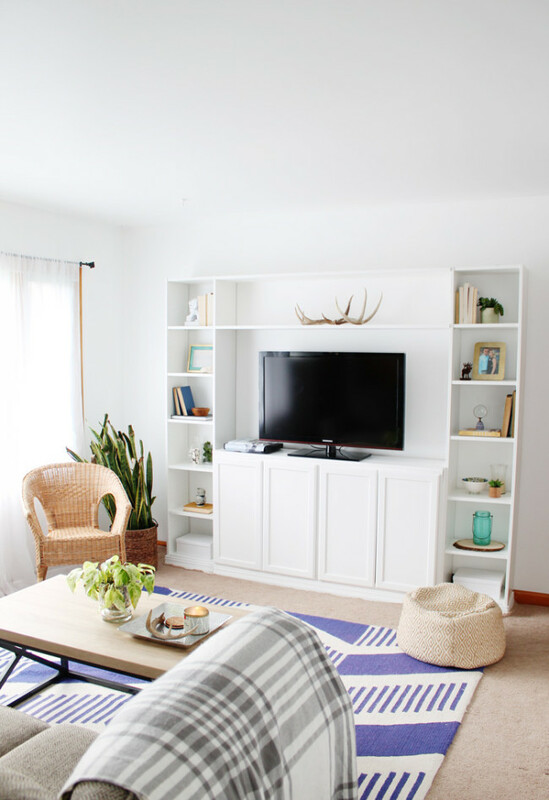 Today, I'm sharing all the nitty gritty details of our living room evolution the past couple years and how we got to the beautiful living room you see today! Before, my style was all over. I liked many different styles and couldn't decide on one, so it ended up being a random mix that didn't work well together. So, first thing I did was get clear on my signature decorating style (here is a super handy worksheet planner that will help you identify your own style). I settled on modern rustic cottage for my style. Here is what my Pinterest inspiration board looks like. You guys, this was KEY in setting myself up for success later as I was selecting new furniture and decor. Finding your style is seriously the secret sauce behind a home you love and a step you can't skip. I even created a whole course called Find Your Signature Decorating Style that makes it super simple and breaks it down step-by-step for you. Now that I knew my style and what items aligned with it, it was time to get rid of the extra stuff I no longer needed or used. I sold a few pieces of furniture on Craigslist and was able to repurpose a few things for different areas of the house. Our sectional moved to the basement family room which worked out perfectly since we did not have seating down there yet. Our living room before was overcrowded with furniture we didn't use and with my new mindset, I only wanted the necessary pieces we actually used. The credenza/bar was simply taking up space, and the straw chair was an accent chair no one sat in. I went back to the drawing board and wrote a list of everything new I'd need. First, I settled on a layout that flowed much better (no more 2 sofas/sectional) and then decided on new furniture. Then, I decided on textiles and lighting, and finally decor. We had been wanting to replace the old carpet with hardwood flooring, so I added that to the list as well. This is where decorating can get complicated. How do you know what kind of sofa or rug to buy? Luckily, because I found my signature decorating style and set a clear plan for color palette, fabrics, patterns, textures, and styles, I knew exactly what I was looking for so shopping for furniture and decor was super simple. In my Find Your Signature Decorating Style course, I teach you how to research furniture and decor and exactly what to look for based on your style, so you are never clueless what kind of couch to get or what rug would look best. 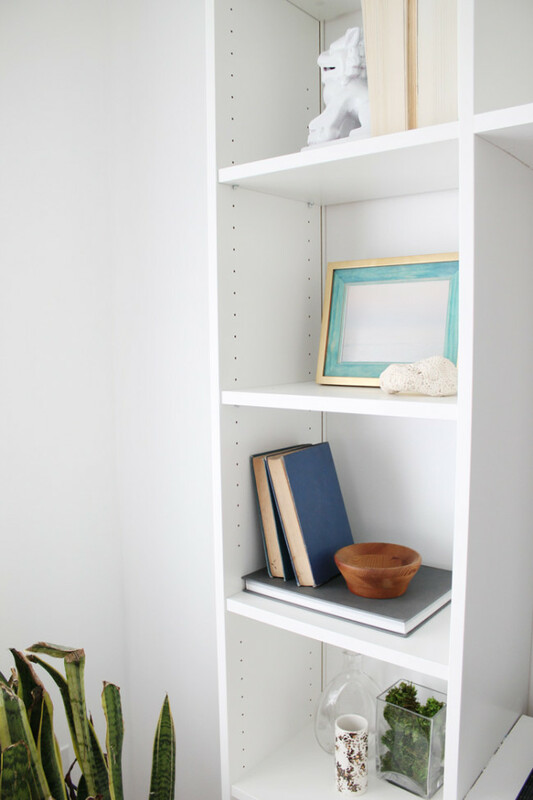 We started our makeover with the built-ins and actually made them ourselves as an IKEA hack. I LOVE them. Next, I swapped out the cheap sheer curtain panels with something a little more natural and warm and with more privacy in the evening. I have Blinds.com wood blinds in our kitchen and love them for many reasons, so I knew they'd be great for our living room and they fit great with my style and overall plan. I love how the wood instantly warms up the room. 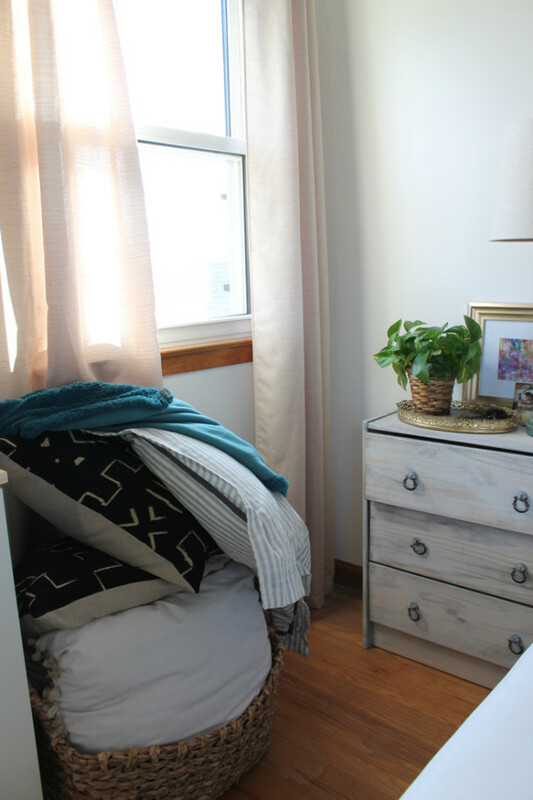 You can read more about the wood blinds I chose and why I love them here. For flooring, I chose warm matte oak engineered hardwood from BuildDirect.com. We have original hardwood in the bedroom and office, but there wasn't any under the carpet in the living room. The original hardwood is a very warm, almost orange-y color, much like the wood trim throughout the house. This orange-y color isn't my favorite (that's an understatement), and I contemplated painting the trim white for a while, so I ultimately decided not to try and match the wood trim or original hardwood with our new flooring. I'm not even sure if this is against some kind of interior design "rule", but I didn't want to be forced into choosing a hardwood color I didn't even like, just to try and match the original flooring and trim (that we might paint). So I chose a flooring that I really liked that still complimented the original floors and trim. Jordon did an awesome job installing it, and we even decided to paint the trim on the spur of the moment since we had to remove it anyway during installation, so I got my white trim! What a difference flooring makes. As I look back on old pictures, the new hardwoods instantly update the room. I'm so happy with our flooring choice and how beautiful it looks. 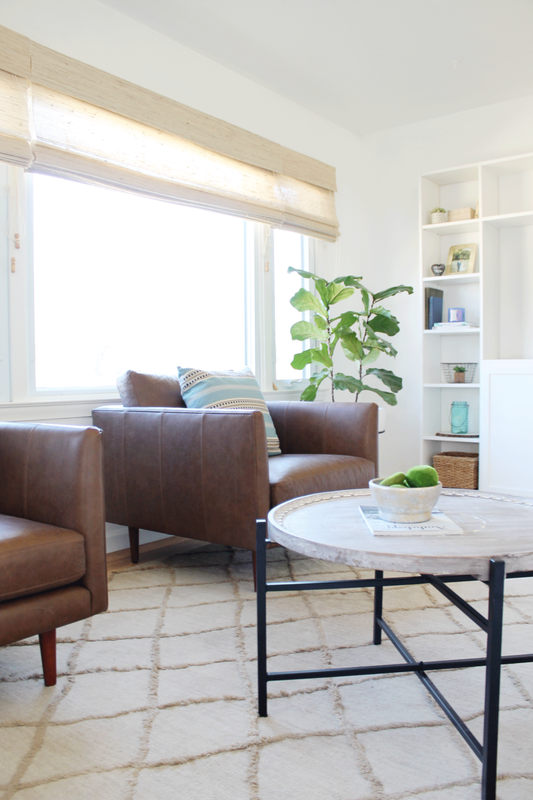 Our new Sitka sofa from Article is one of my favorite things in the makeover. Its modern clean lines align with my style and it fits the space a thousand times better than the big bulky sectional. Plus it's soooo comfy. I wrote an entire post on how to buy a couch you can read here. Pillows are such an easy way to add pops of color and pattern without a big commitment. To bring in more blues, I chose a couple blue printed pillows (blue stripe pillow, blue patterned pillow) from Tonic Living, one of my favorite sources for quality pillows. I already had the tie-dye pillow and black pillows that helped tie in the black in the pendant and coffee table legs perfectly. I'm keeping decor minimal except for the built-ins. I did pick up my favorite plant stand from West Elm and got myself a fiddle leaf fig plant. Wish me luck keeping it alive! :/ Any tips are appreciated as I hear they are finicky plants. The full length mirror was actually a DIY we did. 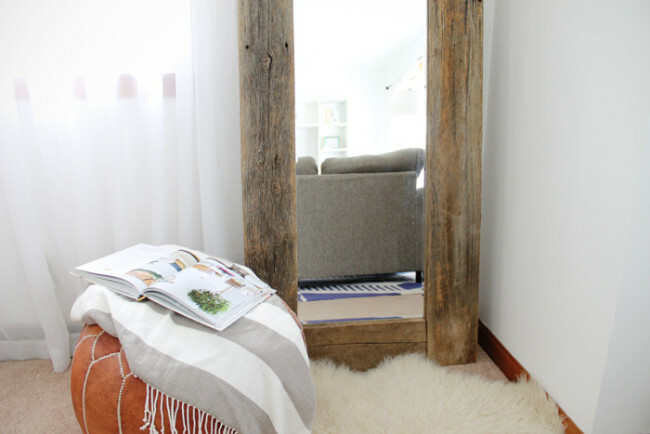 The mirror magically makes the room feel bigger, plus it adds the perfect amount of rustic wood, another one of my style elements. We don't have a ton of wall space for art, but I did want a large scale print above the couch. I like horses and saw someone on Instagram share a photo of this horse picture they had taken. She graciously gave me a copy of the picture and I had it printed and framed at Shutterfly. So easy! I'm keeping the coffee table for now because I like it and it works perfectly. However, it's on my list to get a new one eventually that is round and solid wood, since our current one is not solid wood and is starting to peel. 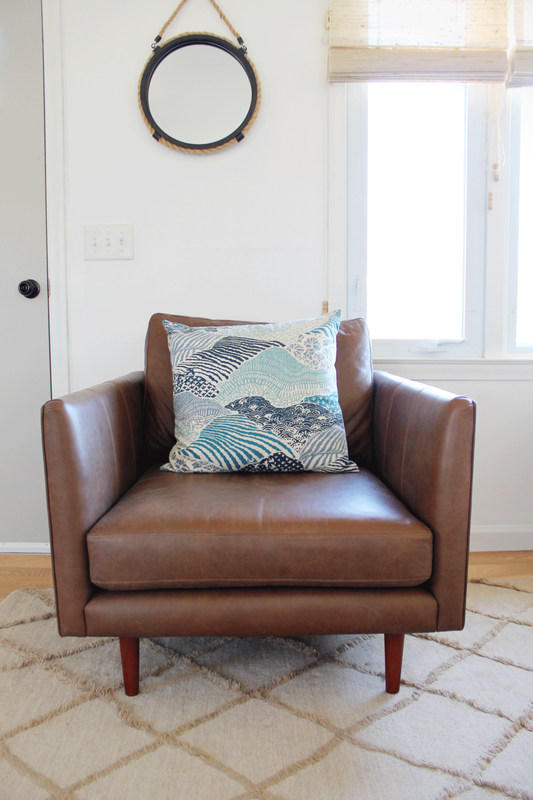 I borrowed the leather pouf from the basement family room and the blue tufted chair is also borrowed from our office. I'm keeping the chair in the living room util we can get 2 cognac leather tufted chairs, but that may be in a year or so. It seriously looks like a different room! It just goes to show that a few small changes make a world of a difference. Every time I walk in our living room it makes me happy. That's the power of decorating and how our homes should make us feel. 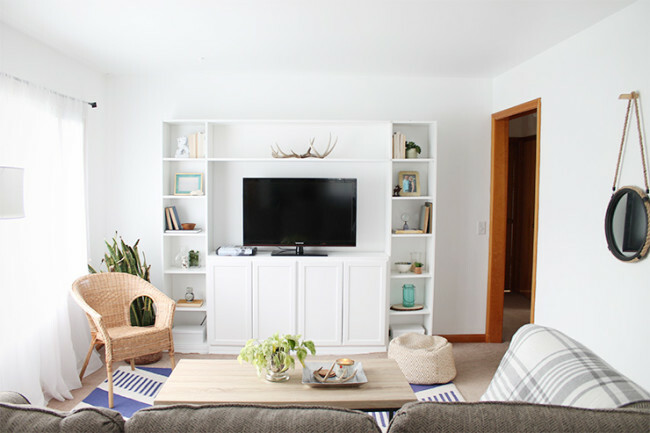 Our living room turned out how I had imagined it would look and it was super streamlined to execute because I had my set plan that I followed. I knew exactly what was on my shopping list and what to look for, all because I found my signature style FIRST. In my course, Find Your Signature Decorating Style, I will teach you the exact plan that I used to decorate my living room from start to finish. This system that I teach applies to any room on any budget. If you have any questions at all about the room itself or the process, please ask away in the comments! I know this was a ton of information. Do you have a room in your home you're struggling with like I was? Have you ever worked really hard on something only to have it fall short? You put in plenty of time and money. You're super excited to get to the finish line and see your vision come to a reality. And then as the end nears you start to notice something doesn't feel right... That's how I felt as I was decorating our living room. When we first moved into our home a year and a half ago (see early photos of the living room here), I scrambled to find furniture and get the room put together so it wasn't bare. I thought I knew my decorating style and vision so I started picking out a couch, a rug, a coffee table – which was all good and exciting. However, as things slowly came together, I didn't like how it was turning out. The style felt off and like it wasn't me, and furniture felt a little mis-matched and crowded. I was buying to fill the space in our living room without thinking about our lifestyle and how we actually used the room. One piece I bought was a credenza on Craigslist for super cheap that I thought would make a great buffet with a bar. We rarely drink cocktails at home (we're more beer drinkers :)) so the bar was completely useless and we never used it. I was frustrated and didn't understand how I missed the mark when decorating. I was disappointed in myself and that it meant I'd have to start over. That's when I really started to analyze my decorating style and be intentional with what we used and needed. I thought if I could just master my decorating style, I'll be much more happy with our home and how it looks. 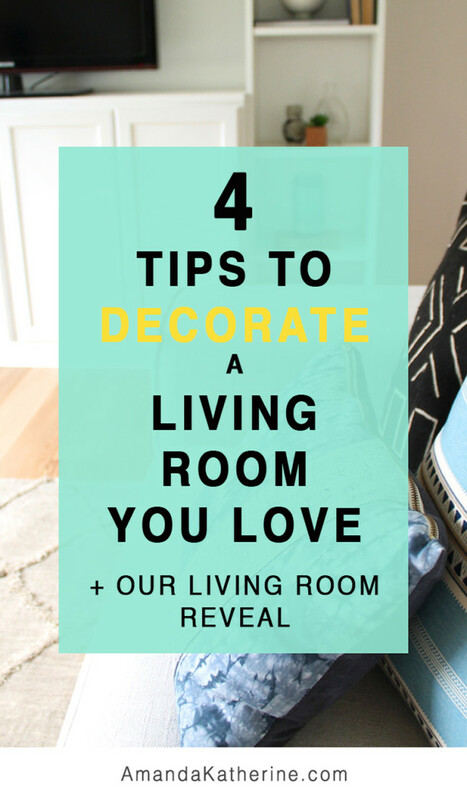 So here we are several months later, I now know exactly what my decorating style looks like and how to achieve it, and we're slowly making some updates to our living room! We moved the other half of our sectional to the basement family room since it was just way too big for the room and that opened up a lot of space (let that be a lesson to you to always measure your room 3 times and include room for walk ways before shopping). I sold the credenza and our old coffee table. We built our IKEA hack built-ins a couple months ago which I absolutely love. They create the focal point our living room needed and are still functional. Once discovering my decorating style, I knew exactly what changes I needed to make so I was no longer guessing. Things are starting to feel much better. Next, we installed new woven wood shades from Blinds.com. We have these in our kitchen as well and let me tell you, they are AMAZING. 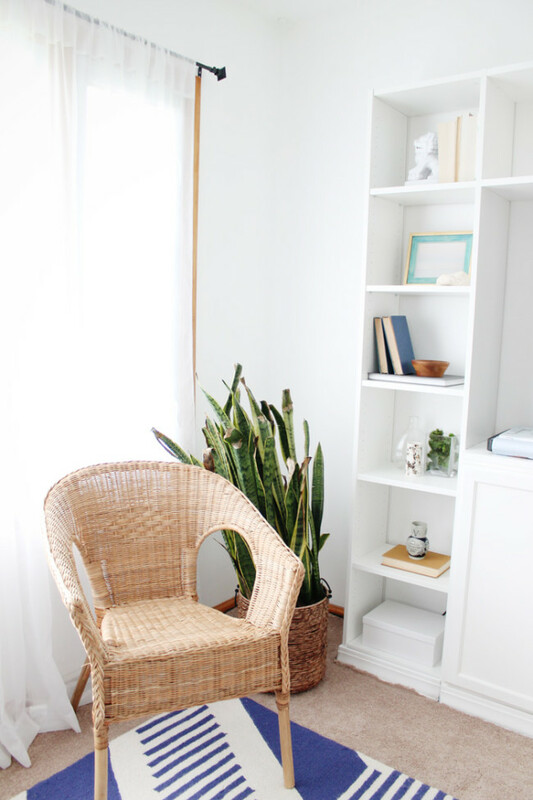 I wanted shades that warmed up the living room a bit (because we have lots of white) so I chose the color rustic jute with some texture and the style fits our beachy cottage style perfectly. My favorite thing about these woven wood shades is they still let light in even if they are down, but if you want to completely block out it out, there are liners you can put down as well. This is a great feature in the evenings for more privacy. They have several color options to choose from (and free samples!) but I'm so glad I went with rustic jute. I had such a hard time deciding on a color but they provided a designer you work directly with and she was so helpful and made the process super easy. Can't recommend them enough! Another favorite update in our living room is the new star pendant light from ATG Stores. We finally replaced the ugly outdated ceiling fan! Lighting is like shoes to an outfit. It pulls the whole room together. We never used the ceiling fan and I'm not a big fan of them anyway (ha! no pun intended), so I knew I wanted a pendant light instead. 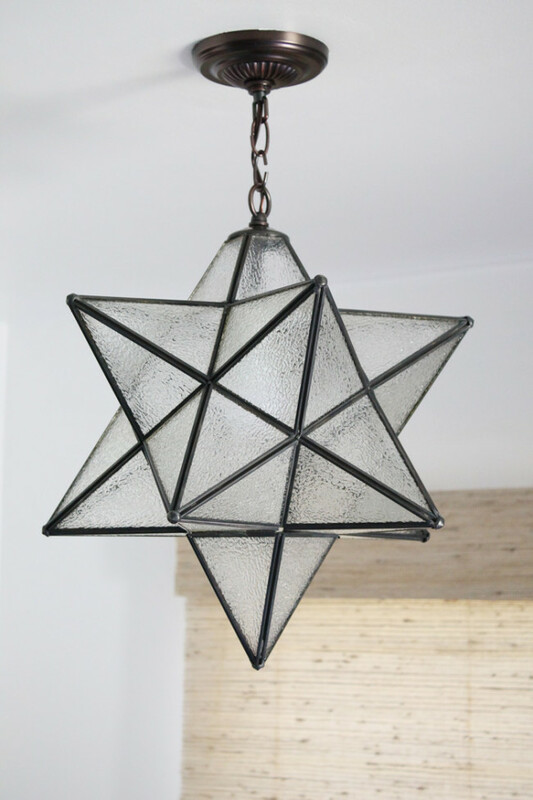 The star pendant is fairly popular and some of my favorite room designs on Pinterest had one, so I thought it would be a good option for our living room. It's a little traditional yet whimsy so I think it adds some personality to the space. I found a star pendant at ATG Stores and it received great reviews so I decided to go for it. I chose the medium size in clear seedy glass (textured instead of transparent glass) and I'm so glad I did. It looks so good and is just as I pictured! It seriously makes me so happy every time I walk in the room. A little tip when you're shopping for lighting...I like looking online because there are so many more options than in-stores and you can measure your space to see how each light would hang. Pendants are great because you can adjust how low it hangs which was important for me since our light is in a traffic area and we don't have tall ceilings. We have a long white wall in our living room that I've really struggled with decorating. It's so long that it's hard to fill the space properly. I didn't want to do a gallery wall because I want to keep the look fairly minimal and gallery walls tend to look busy. However, buying a piece of art that's big enough is very spendy. I was on Instagram one day and NicholeLynneDesigns posted a photo of this horse photograph her sister had taken. Horses are special to me because my grandpa had them when I was a kid and I enjoy riding them. I asked if she was willing to share the photo and she was! I had the photo printed at Shutterfly and decied to also have them custom frame it. I looked around at prices for large frames to buy and they were expensvive, so Shutterfly was the best option. They have sales often where you can get 40% off your order! I was a little nervous about the print quality on such a large photo, but when it arrived in the mail it was perfect and not a touch blurry or pixelated. I think it's the perfect piece for this wall. I'm really happy with how it looks. We've made some serious progress and I'm already loving it so much more. On the list of future updates is a new couch with a lighter color (more inline with my decorating style) the end of August. We will move our current sofa to the basement family room which will be perfect down there. I'd like to get a couple chairs for some additional seating as well for the living room, a neutral rug, and eventually I'd like to remove the carpet and replace it with hardwood floors. Have you had a similar experience as I have while decorating? Tell me about it in the comments! 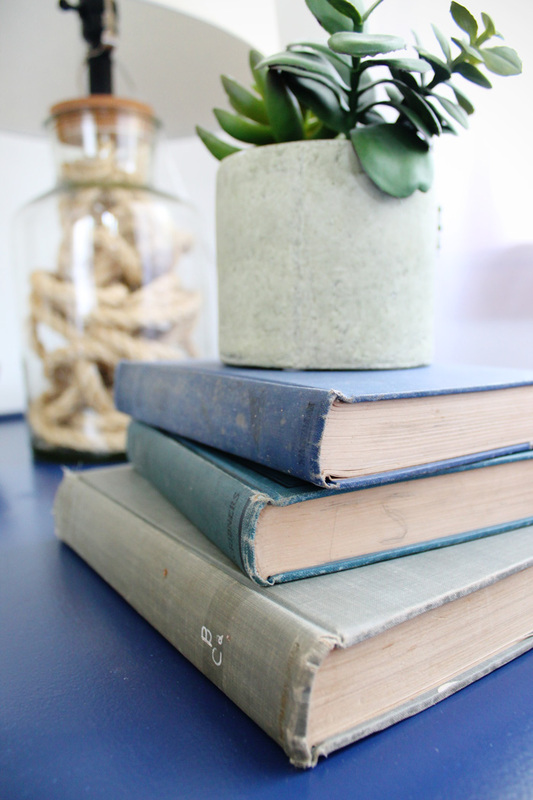 Today I'm sharing one of my favorite DIY projects I've made yet. This one is fairly simple to make and looks wayyyy more expensive than it really is. We have a little window nook in our living room that I'm struggling to decorate. Previously, we had a credenza in the nook (seen in this post) but we sold that, so next I positioned a chair and table in the nook (seen here) but wasn't happy with that either. I considered making a built-in bench to fill the nook, but I don't know if I want to commit to that since it won't be removable. The window is off-center in the nook so it's throwing me off. I thought a full length leaning mirror might fill the empty space next to the window nicely, and it would also help make our small living room seem bigger, thanks to the magic of mirrors. However, mirrors are expensive. Like SUPER expensive. Specifically, this mirror at West Elm I liked that costs $500. So I did what a cheap girl like me does best and came up with a DIY version for a fraction of the price. 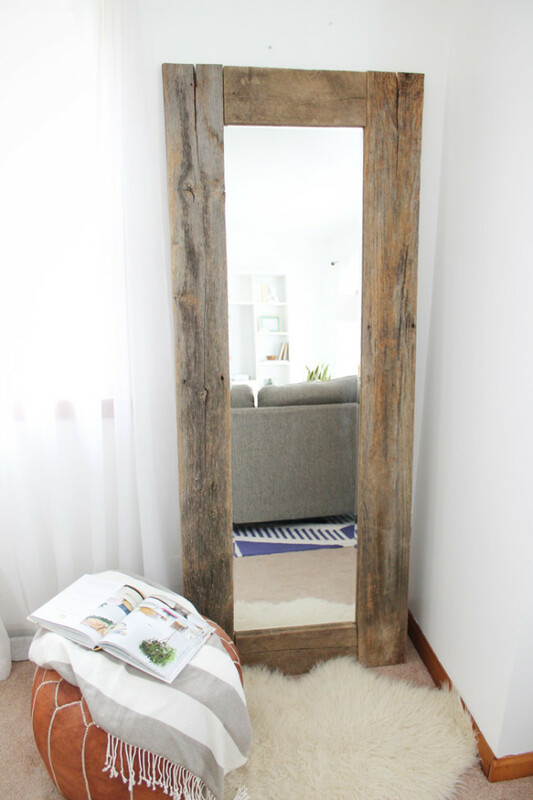 Keep reading to see how I made my own DIY rustic wood frame mirror for only $45. Talk about a big bang for your buck! I had our plywood cut into a 24 x 70" sheet at Home Depot. Originally I was planning on getting a 12 x 58" mirror but they didn't have one in-store so I got a slightly larger mirror and that just meant our wood frame edges would hang off slightly from the backing. Our reclaimed wood is 6 inches wide. 1. We started by measuring and marking where the mirror should be positioned in the center on the plywood backing. 3. and set the mirror in place, pressing firmly to secure. 5. and set the first wood board in place. 6. We clamped the board to make sure it bonded tightly. Unfortunately, we only have one clamp so we made due and had to move it from end to end after it dried for a few minutes. Not ideal but it works. Repeat the same gluing process on the other side. 7. After the 2 sides were glued in place, we moved to the top and bottom boards. Apply more Liquid Nails Fuze It and clamp them in place. 8. To ensure the wood adhered to the plywood backing, we set a few 80 pound bags of Quikrete we had laying around to hold everything down in place while it dried overnight. The next day I checked it and everything was nice and secure so I brought it in our living room to use. I absolutely love how well it turned out! 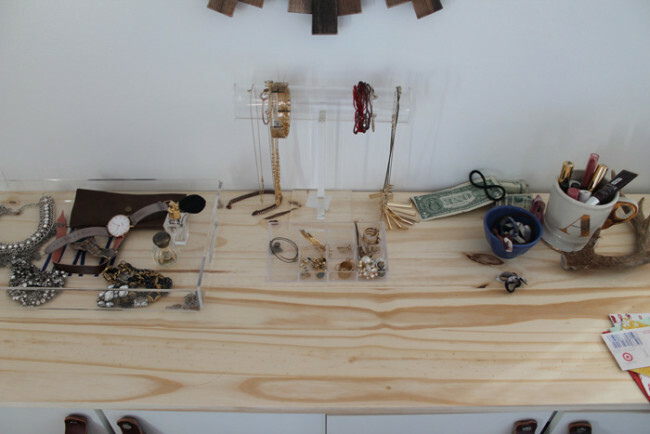 This is such a simple DIY with a huge impact that would cost hundreds of dollars at any store. I'm already tempted to make another one for our bedroom because it looks so much nicer than those cheap $12 door mirrors we have right now. Here you can see the mirror leaning perfectly in the little nook in our living room. I've made a few more updates to our living room since you last saw it when I showed our IKEA hack built-ins, so I'm planning on sharing a reveal soon! Thank you to Liquid Nails for partnering with me on this post. Liquid Nails is a regularly used product in our home and a brand I love and trust. 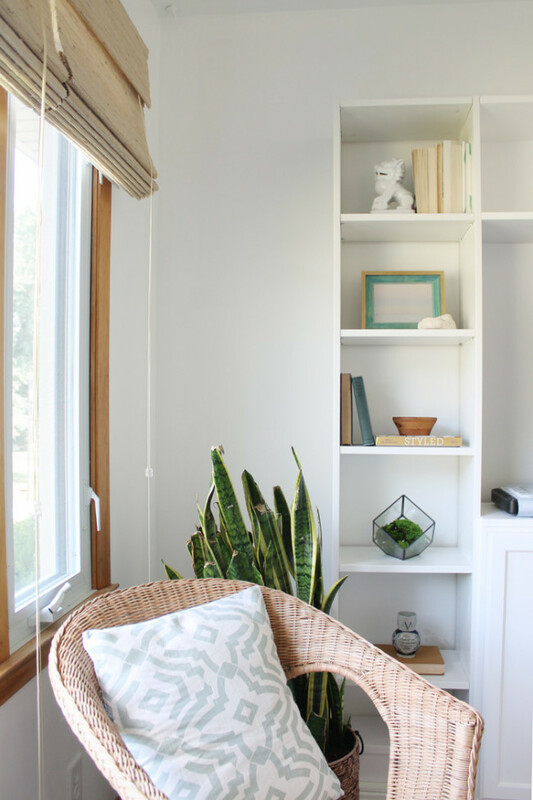 I've always loved built-ins and they popped up several times in my Dream Home pin board when analyzing my decorating style, so I knew they were always something I wanted to incorporate into our home. When we first moved in we made a quick TV stand from an IKEA Kallax shelf, but I was never 100% happy with it. Our living room is small, and it just didn't have a good focal point. Good-bye old TV stand . . . I LOVE the way they turned out! We were able to finish them in a weekend for about $300. There are all kinds of styles and ideas out there for built-ins. Originally, I was thinking we would just build them from scratch, making the shelves and cabinets ourselves. After more research and asking Jordon if he thought he could do it (he's not a professional builder and has limited time and tools), I decided to look into DIY versions that we could piece together to make things a little easier. I found several tutorials but none of them consisted of everything I wanted. I wanted our built-ins to have cabinets for the TV to sit on and for storage, plus open shelving on the sides, and a top shelf above the TV. 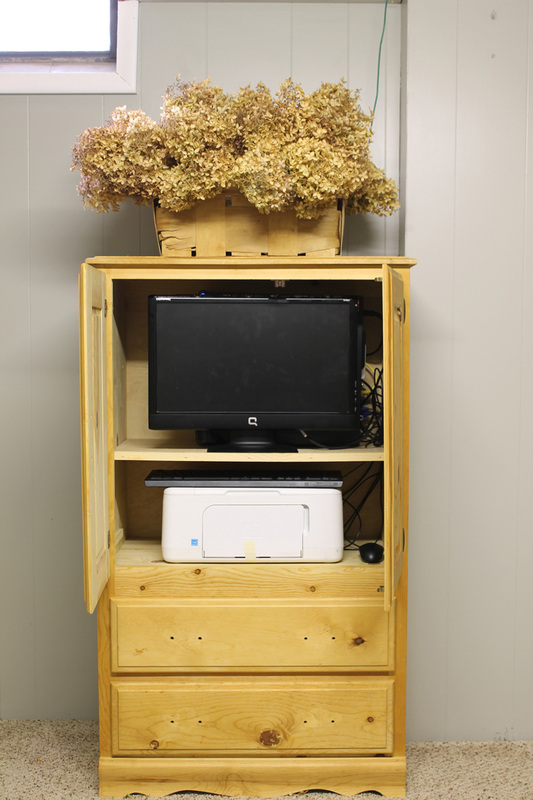 In the tutorials I found online many people used the IKEA Billy bookcases. There are a few different sizes of the Billy bookcase to choose from. Because our wall isn't huge and the built-ins couldn't extend from end to end (it would cut off part of the doorway) I thought 2 single Billy bookcases would fit nicely, I just needed to figure out how to create the cabinets. The Billy collection did have the option to buy doors to attach to the bookcases, however, the doors were $40 a piece which would get spendy fast. That same day I was browsing IKEA's site, I went to Home Depot for something else and ran into some pre-fabricated cabinets on sale. They were exactly what I was looking for and much more affordable than buying IKEA doors to create our own cabinets. I drew up the design and Jordon liked the idea so we ordered the IKEA shelves and went back to Home Depot to pick up the cabinets. Just an FYI, the cabinets are 12 inches deep and the IKEA shelves are 11 inches deep but the difference didn't bother me. For installation, we loosely followed this tutorial by Centsational Girl, but had to make our own adjustments and used trial and error along the way. First, we measured where the built-in would stand centered on the wall and marked the area off so we could cut out carpet and remove the baseboards along the wall. To remove the carpet we just it out with a utility knife. Because we decided not to use the original baseboard along the front of our built-ins because we didn't have enough and I wanted it white, we didn't have to be super cautious about not damaging the trim. We used a 6 inch pry bar to loosen the baseboard, starting near a nail hole. Be careful not to pry the bar into the wall because it will damage the drywall (to prevent damage, slide a putty knife behind the trim as you wedge the pry bar). We raised the cabinets about 3 inches using 2x4 boards to create an illusion of a built-in. Had we not raised it, we wouldn't have been able to run baseboards across the entire bottom because the cabinets sat lower than the bookcases. We attached the frame into the wall studs and then screwed the cabinets into the frame. Then we assembled the IKEA bookcases and lined them up against the installed cabinets. We used a small L bracket to secure the bookcases to the wall so they won't tip. The bracket is small enough visually you can't see it unless you're standing back far in the room, but it can be painted white to disguise it. We used a 1x12x60" board and glued it on top of the cabinets for a nice platform for the TV, holding it with clamps until dry. 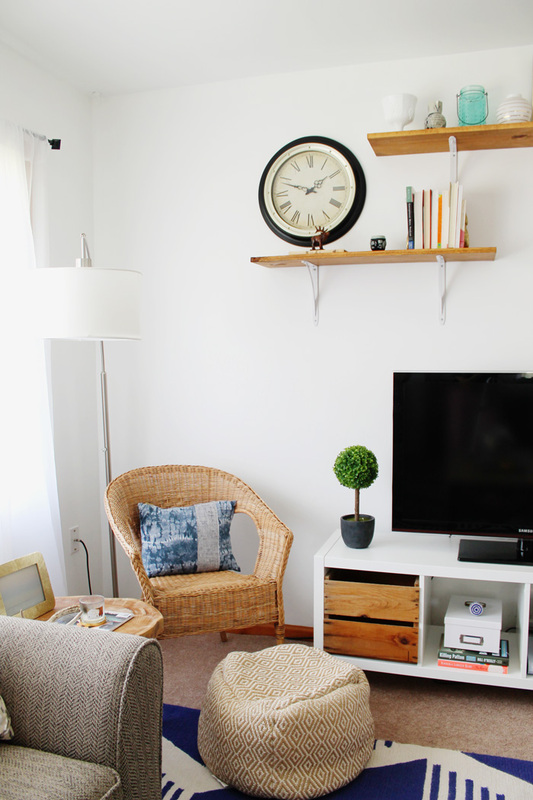 To create the floating shelf above the TV, we took 2 more 1x12x60" boards and made pocket holes using a kreg jig. Then we used pocket screws to screw them into the IKEA bookcases, lining then up so the shelves are straight across. Without pocket holes, we would have had to mount the shelf using brackets which wold have been visible. A little reminder to plug your TV in the wall and bring the cords around the back BEFORE you attach the 2 bookcases to the wall. We were all finished with the built-ins and went to plug in the TV when we realized we forgot to account for the cords. We ended up having to drill into the wall and shelf creating a crevice to run the cords. For the baseboard, we used the only 3 inch trim we could find in Home Depot and screwed them in using small screws. To cover the gap where the shelves meet the cabinets, we used an edging that concealed it perfectly, using caulk to fill any seams. Everything got a fresh coat of white paint by Behr (what we used on all the walls in our home). We didn't actually paint the IKEA shelves and found the whites to match almost identically. Overall this project cost us around $300 in materials and we did it in one weekend. I'm soooo happy with the results! I can't believe how good it looks and we were able to do it on a pretty small budget. The built-ins create a nice focal point that our living room really needed. 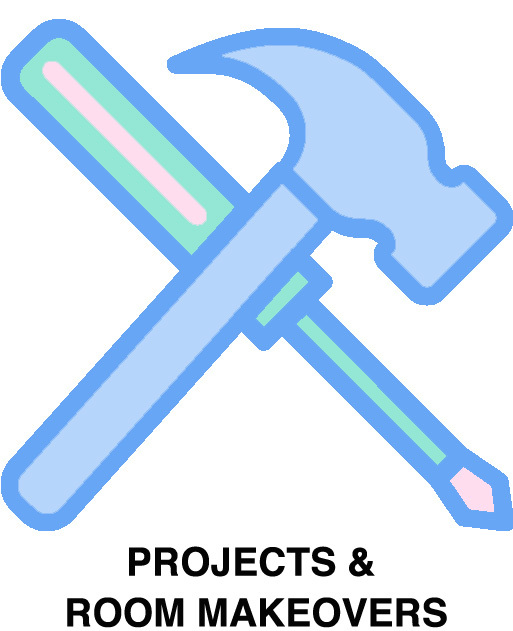 I have a mental running list of projects for the house to tackle. Occasionally, I'll mention an idea to Jordon in conversation to see if he has any thoughts or ideas, but I usually get a, "that sounds good" reply. A couple days after mentioning I wanted to rip out the current stair runner, paint the stairs, and install a new runner, I got this pic message while I was at work. On his day off, Jordon had ripped off the old runner. The old runner was some kind of textured rubber. Apparently the previous owners only painted part of the stairs brown and the cream part was hidden by the rubber runner. Because our house is a split level ranch, the entryway from the garage leads to the basement, so right when you walk in the door the first thing you see are those stairs leading up to the main living area, kitchen, bathroom, and bedrooms. I hated the huge eyesore right when you walked in, so I give it a little update. That weekend after Jordon ripped off the old runner, we painted the stairs white. Jordon started by priming them on Friday while I was at work. Then on Saturday when I could help, we used our HomeRight Max Pro paint sprayer and it worked like a charm for the stairs. It was super quick and covered well. For the second coat of paint we did use a brush though to make sure it was nice and even with no streaks. While the paint dried, I contemplated what color of runner to get. I considered a black patterned one or a rugby stripe one, but ultimately decided to play it safe and chose a sisal rug with grey border. 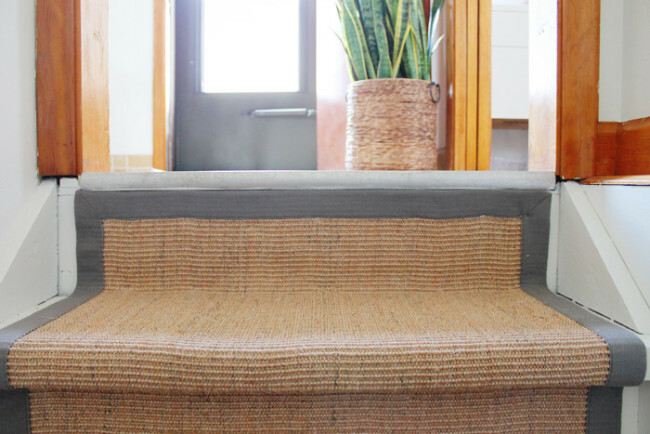 Sisal is not only durable and cleanable, (dirty shoes will be walking up and down the stairs constantly) but super affordable. We lived with the painted stairs for a few days while we waited for the runners to arrive. For staples, I picked up some 13mm staples that are made for upholstery and are much longer than a standard staple. 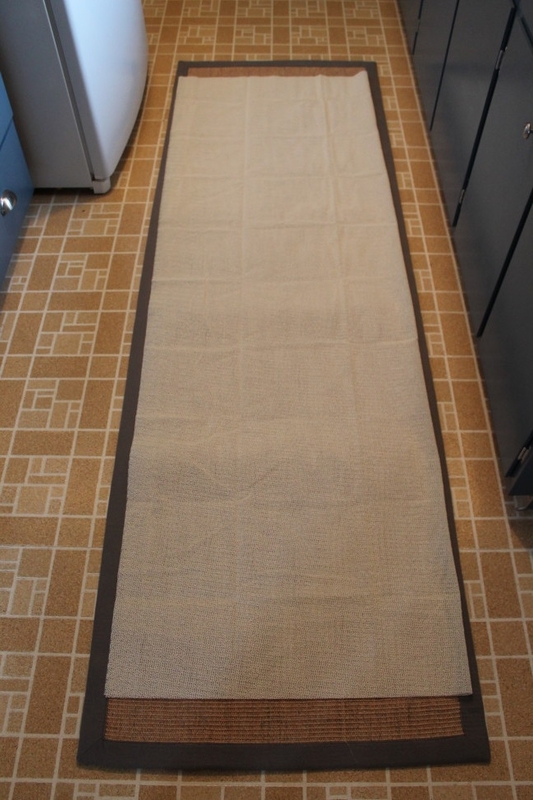 We chose to use a rug pad as well to keep the runner from slipping. I picked up a 5x8 rug pad at Home Depot for about $20 and cut it into rectangles to fit each step. We didn't adhere them to the steps beforehand, knowing the staples would keep them in place. For installation, we started with the top of the stairs and worked our way down. Jordon pre-measured the stairs all the way down and marked on each step with a pencil where the rug should line up on each side so it was centered. 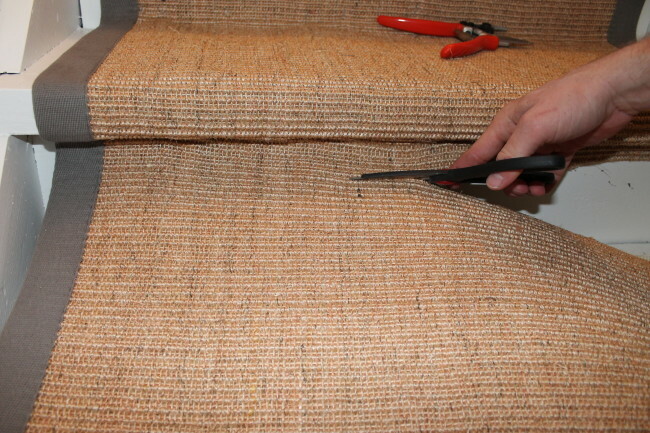 Then, we started by lining the top of the rug up with with the top of the first riser and stapled it across. We didn't staple on the grey border because the staples would be much more noticeable. Next, we pulled the runner tight and stapled along the bottom of the riser. We also chose to staple under the nose so the runner was tight instead of creating a waterfall look. Here is what our stapling process looked like. I was helping hold the runner in place while Jordon did the stapling. Since it wasn't an electric stapler, it required lots of power and pressure. When I attempted to staple it, the staple was sticking out a half inch since I couldn't press down hard enough. It took a bit for us to get in a zone, but once we got going it went pretty fast. One runner wasn't enough so we knew we'd have to join the second one seamlessly. To prevent any obvious transitions from the first to the second rug, we wanted them to meet under the nose of a stair. Once we reached the end of the first rug, we cut the rug so it was just long enough to staple under the nose. Then we cut the grey border off on the second rug and stapled that right under the nose as well. It was hard to capture photos of it at the same time, but we followed the same stapling pattern through the entire project. Unfortunately, we realized 2 rugs were not long enough so we had to order one more rug and finish that one a few weeks later. Our stairs weren't all the same size so it threw off my measuring when I was ordering rugs. Oops. Once we reached the bottom of the stairs with our third rug in place, we cut off the excess rug. Because the third rug didn't end perfectly with the end of the stairs, we had to rejoin the bottom grey trim that we cut off earlier. We simply stapled the grey trim at the bottom of the stairs and that covered any unevenness from cutting off the excess rug. If the light hits the staples just right you can see them a little, but it's not noticeable unless you look for them. 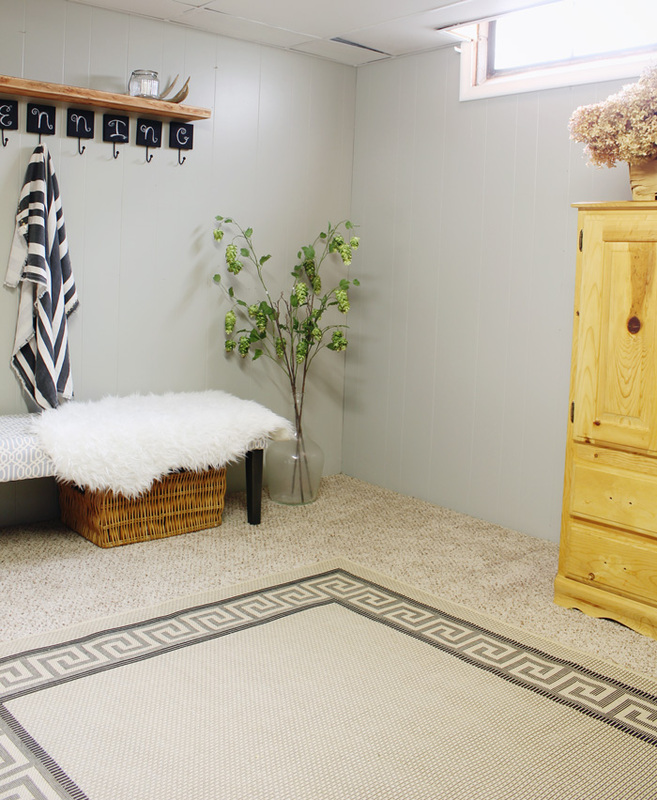 On this tutorial from One House Love they actually colored the staples black with a Sharpie to match their runner, so I may see if I can find a similar brown to our sisal rug to color the staples. Overall, it was a fairly easy project that completely updated the stairs. I'm so happy we no longer have a huge eye sore right when you walk in the house! As far as budget, we spent $185 for 3 rugs, $20 for the rug pad, and $3 in staples, for a total cost of $208 . Not too bad for a little weekend project that makes our stairs looks SOOO much better. Eventually we plan on adding a pendant light at the top of the stairs (right now it's just a bulb) and a large piece of art on the blank white wall above that you see when walking down the stairs. I have been wanting to do this post for a while. While I love social media and being able to connect with so many amazing people, it puts a façade out there and we only show "the good parts." Obviously that's not realistic, or real life, and it sets high standards that we are unable to meet. The styled photos are nice, but I don’t want to set the expectation that your home should always look photoshoot-ready. That's exhausting, not to mention time-consuming and just silly. It's important to remind ourselves that social media is just that: a highlight reel of the good parts. I, too, have gotten caught up in the social media frenzy and need for perfection. Those all-white, spacious, gorgeous kitchens on Instagram have me yearning for the kitchen of my dreams, only to see our outdated 1950s galley kitchen starring back at me. Truth is there is always more. Bigger. Better Faster. I'm trying to focus on doing the best with what we have now, so I don't bring up those feelings and the need for perfection that ends up making everything seem inadequate. 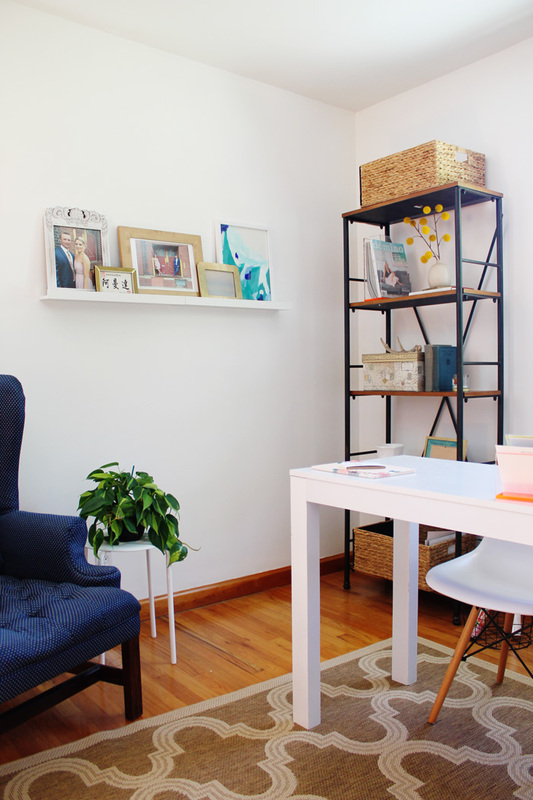 In an effort to always be transparent and authentic, I thought it'd be fun to pull back the curtain and share what it truly looks like in the homes of bloggers on a day to day basis. No perfectly styled photoshoots and edited photos. Just regular ole life. I teamed up with a great group of bloggers today and they are all giving you a peek into their home and what it looks like on a regular basis. Be sure to check them out at the bottom of this post. I snapped these photos on a Sunday afternoon right after we finished installing the built-in bookcases in our living room. We always have some kind of project going on so tools and materials seem to be laying out often. Look at those pretty (not yet styled) built-ins! I will be sharing how we built them with an IKEA hack soon. When I took these photos the living room was in pretty good condition. No laundry waiting to be folded or bills sitting on the coffee table. The TV of course is on sports all weekend long when Jordon is home. I struggle with coffee table decor because I want something stylish but not something huge that takes up lots of space. We do eat in the living room sometimes so we like room to set our plates on the coffee table. A few days after I took these photos, we sold that credenza on Craigslist. We're moving one of the couches to the basement so I'm switching up the living arrangement. Here's our 1950s kitchen in all its glory. Linoleum floors, laminate countertops, and the original oven just big enough to fit a large pizza ;) Someday we plan on updating it. We had a white table before, but my brother gave us this dark wood table set he no longer used that was a little bigger. 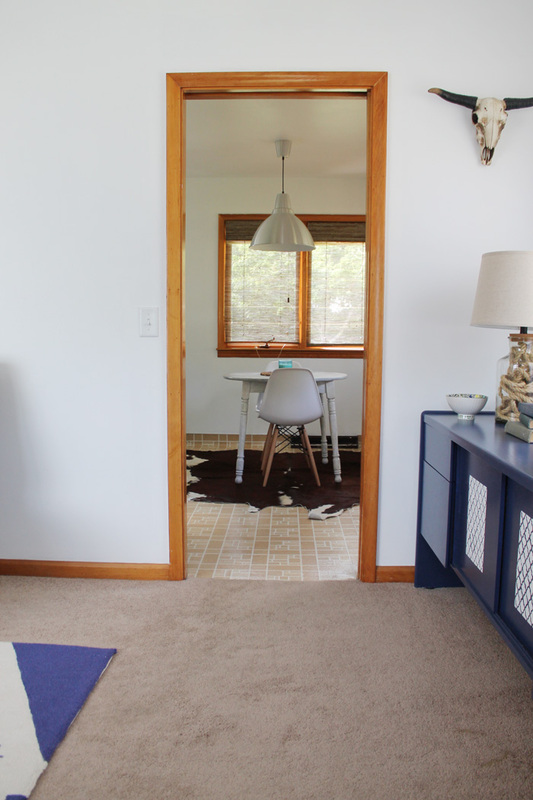 Definitely don't love it with the dark cowhide rug, so we may be moving the rug to the basement. Dishes are absolutely my least favorite chore ever since I was a kid. I'm really good at putting them off since we don't have a dishwasher. Luckily Jordon doesn't mind helping out. This is the stack of clean dishes that needs to be put away. This is our main hallway in the house connecting every room. You can see the old carpet we had to cut out when installing the built-ins has yet to be put away. I HATE the orange wood stain on the trim in our house but can't build up the courage to paint it. Anyone have good solutions for organizing and storing jewelry? The stack of pillows we never use. How is it possible that a bathroom mirror gets so dirty? Make sure to check out the other bloggers' real life home tours below. Last week I mentioned Jordon was building a TV stand for the basement and we were hoping to finish it this past weekend. Well, we did! And now you're getting a first look. Isn't it amazing?! I couldn't be more happy with how it turned out. Jordon tackled the majority of it in one day, and then finished painting and barn doors another day while I was at work. The exact tutorial for this TV console is from Ana White. It gives you the cut list and step by step directions. For some reason, however, the tutorial didn't include instructions for the barn door or the hardware. I was looking online for barn door ideas and all the actual barn door hardware was SO expensive. Like hundreds of dollars expensive. We were building the piece in the first place to save money, and spending hundreds on hardware seemed silly, no matter how cool it looked. So we had the idea to create our own DIY barn door hardware. Jordon did this all while I was at work and even took a few photos! All the materials are found in the plumbing section except for the U bolts. We wanted black hardware so we spray painted all the materials. Find the center of the bar and align it with the center of the TV console. Screw in the elbows to the flanges and screw the pipe into the elbows so everything is connected. Then drill in the 2 outside holes on each flange. Jordon said this takes a little trial and error. If you can't drill in the screws to the flanges you can unscrew the pipe to make it a little easier, but it takes precise measuring to make sure it lines up when you can screw in the pipe again. Drill 2 holes in each barn door 6 1/2 inches apart for the U bolts. Then put the U shaped part through the holes and attach the flat piece and nuts to secure it. 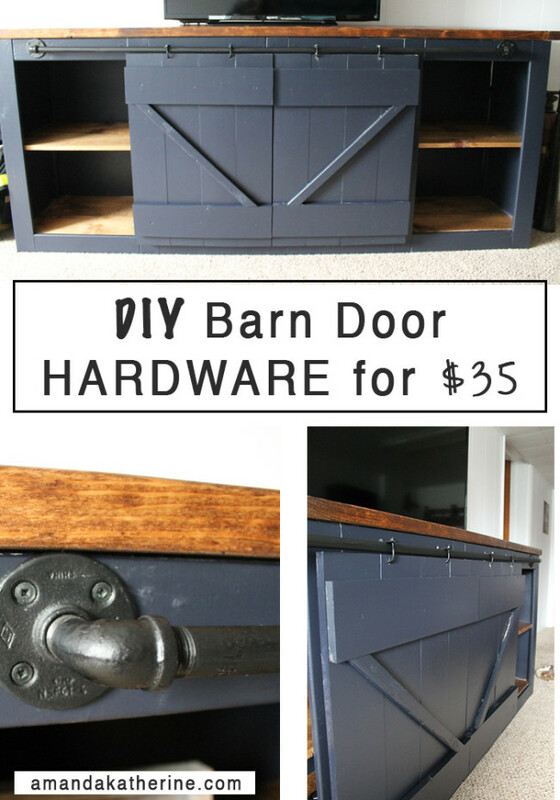 It's such an affordable solution for the barn door look and it works great! I love how the entire project turned out. We still have some more updates before I reveal the entire basement, but it's coming soon! IKEA is great for lots of things like cheap furniture, they however, are not good for hardware. The vanity in our bedroom is a $60 IKEA hack made from two Fullen sink cabinets with a white board from Home Depot sitting on top since it is made for a sink. I wanted a modern vanity that was cheap and couldn't find any great options until I came across the Fullen. 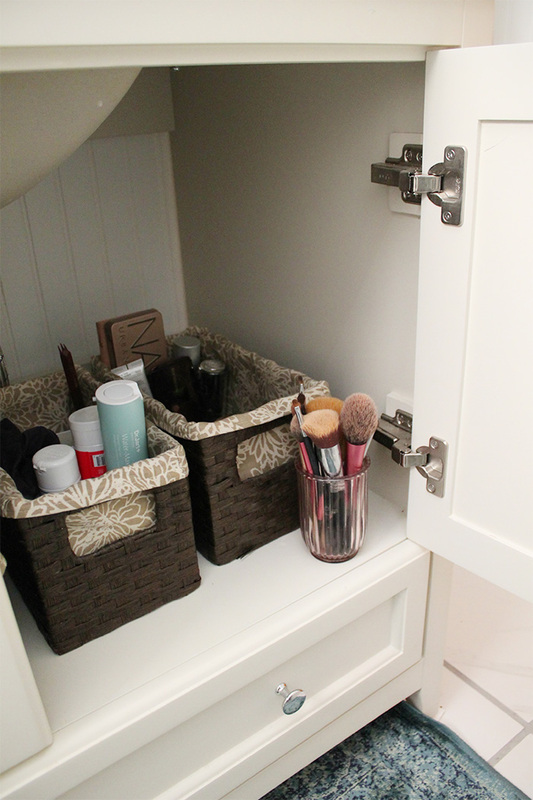 It's a super affordable solution that works great for storing jewelry and other random things. I will warn you it's not the highest quality and the back and top are all open (which is why there is a board resting on top), but that is expected for $30 a piece. The vanity came with plastic handles that I lived with for over a year, but the other weekend the idea for leather pulls popped in my head to spice it up and give it a little more style. Originally I was going to up-cycle a leather belt but my thrift store didn't have any so I headed over to Hobby Lobby to check out the leather section and found a bracelet kit. It was pre-cut and had snaps but it was cheaper than buying buying a leather strip. Here is the simple tutorial to make these pretty leather pulls! If you do chose a strip of leather you can cut it to size using a utility knife and make a hole using a drill. Since my leather was pre-cut, I just had to remove the snaps using a pliers. To remove them, pull on the end you will be able to shimmy it through the whole in a couple minutes after working with it. The leather was natural so I decided to dye it a dark brown. Jordon has this Kiwi Brown Leather Dye for his work shoes and it ended up being the perfect color. Simply rub it on and let it dry in between coats. Take your hexagon bolts and put them through the hole creating a loop. I had to drill a larger hole in my vanity to fit the bolt. Because of the way the vanity door closes, I couldn't fit a nut on the end of the bolt to secure it, but it fits tight enough that it doesn't come out when pulling on the leather loop. Such a simple and pretty way to update any piece of furniture! It has a cool modern rustic feel. 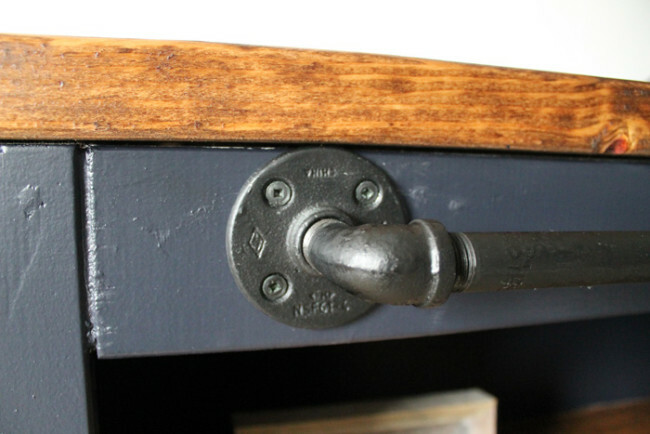 Lindye Galloway is an amazing interior designer and used leather pulls on her closet drawers which I LOVE. I've made a few updates to our bedroom and will be sharing a reveal soon! 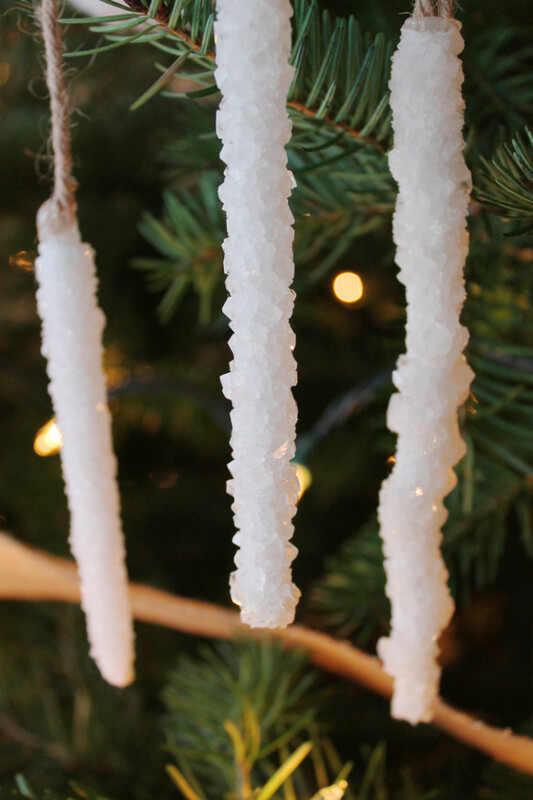 You may have spotted my DIY icicle ornaments last week in my holiday home tour, and as promised, here is how I made them! There aren't many steps to this tutorial, but you will practice your patience while waiting for the crystals to form. These icicles were inspired by the version I spotted at Pottery Barn, but I knew spending $5 per ornament was out of my budget. I remembered my mom making Borax snowflakes when I was a kid, and thought I'd give the old trick a shot myself. This is a classic experiment that's been around for a long time, but this is the first time I've actually tried it! I don't know who discovered laundry detergent forms crystals, but it's kind of genius. Christmas ornaments are expensive when you buy them at the store, but I'm happy to say I made 18 icicles from a $4 box of Borax and I still have a quarter of the box left. Seriously. Bonus: You can see my other favorite money-saving holiday DIYs here. When I first started I was leery they would turn out, but sure enough, after a few hours, you could see the crystals forming on the pipe cleaners! Fill your pot with water and bring to a boil. Once it comes to a boil, slowly stir in the Borax. 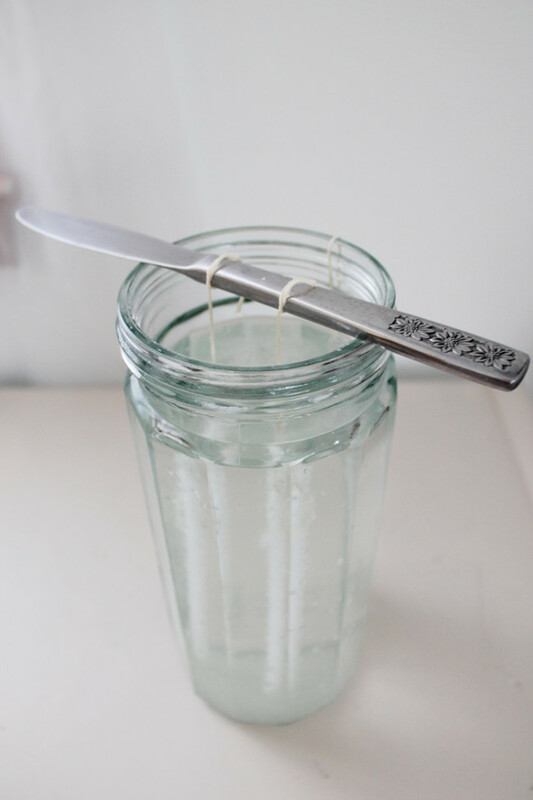 For every 3 cups of water stir in 9 tbsp of Borax. Stir well until the Borax has completely dissolved, about a few minutes. Once it's crystal clear you're good to go. While you're waiting for the water to boil, you can start prep work. 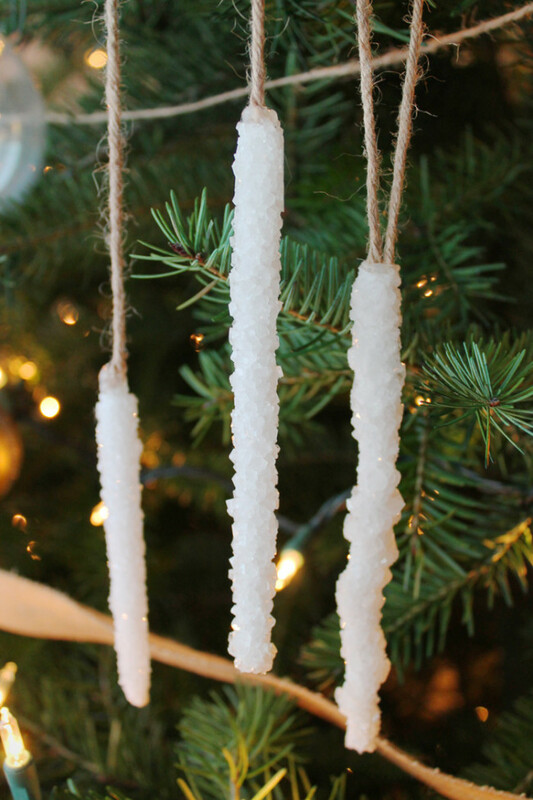 Cut pipe cleaners to the length you want your icicles to be. 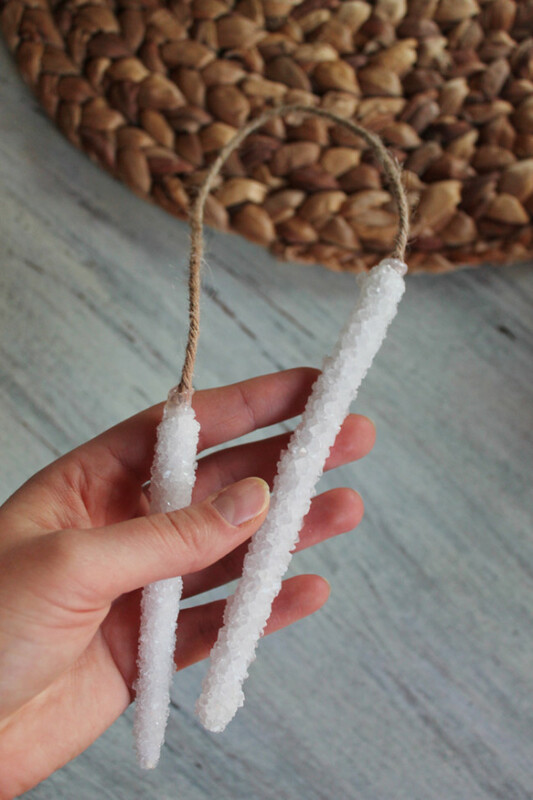 The pipe cleaners will become the icicles and you'll hang them in a pot of water. So make sure when you're cutting the pipe cleaners to allow at least a half inch from the bottom of the pot so they don't touch. Find a knife or cooking utensil that lays across your pot or jar. Then, take some string and tie it around the top of the pipe cleaners and around the cooking utensil so the pipe cleaners floats in the pot without touching the bottom. Once your mixture is dissolved, you can either leave it in the pot or pour it in a glass jar. I wanted to do multiple batches at a time, so I left some in the pot and poured some in the jar. Next, drop your pipe cleaners that are tied to a utensil in the water, making sure they aren't touching each other or the sides of your container. For a large pot that is about 12 inches in diameter, I put in 8 pipe cleaners, and the glass jar I put in 3. I found that the fewer pipe cleaners per container, the more crystalized they get. Set aside your container in a safe place so it can cool. 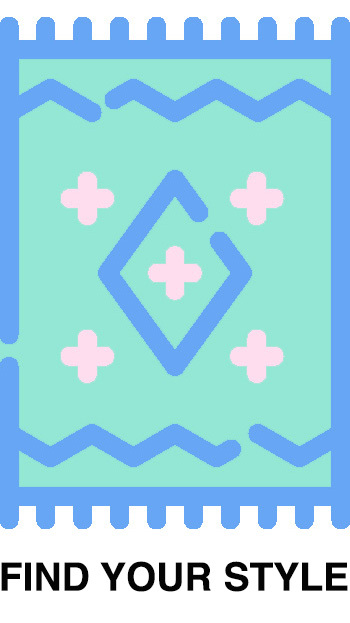 Now you practice your patience and wait for the crystals to form. I let mine set for a good 12 hours overnight, but I think 8 is sufficient. When you wake up, they will look like this! To add twine string, I cut the top part of the pipe cleaner where the string was tied and super glued one end of the twine string and then super glued the other end to another top of an icicle. If you don't want two icicles on a string, you can create a loop with the twine instead. I took photos of this but when I went to edit them, I couldn't find them on my SD card so I'm not sure what happened. I snapped some more pictures after they were all super glued, but you get the idea. Fill the pot again and bring it to a boil and all the crystals will disappear that were stuck on the side of the pot. A bonus with using a glass jar is it forms crystals too! I thought it looked cool so I added some LED candles and set it out for decoration. These icicles turned out great and are probably my favorite Christmas decoration! Nothing beats a good knock-off that costs a fraction of the store price. 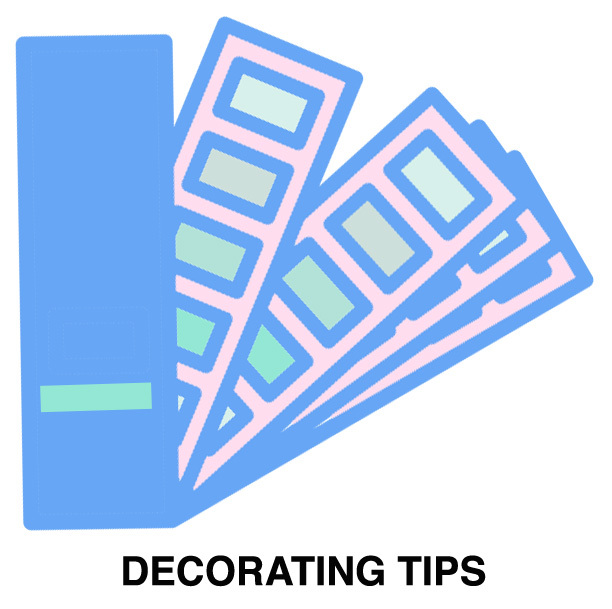 Do you need help decorating your home? Take my free 5-Day Decorating Challenge and learn the basics to refreshing any room! Want more holiday DIY ideas? Check out my favorites here. As I'm transitioning my decor to fall, I wanted to bring in some metallics as pretty accents. I love the look of mercury glass but it can get spendy. Thanks to Rustoleum they have a mirror effect spray paint that achieves the same mercury glass look in minutes (and for a fraction of the price)! *If you love mercury glass as much as I do, you might like these other 13 ways to use mirror effect spray paint. Glass of your choosing. I go to the thrift store and find vases and candle holders for like $2. Make sure your object is clean. According to instructions it says to spray the opposite side you want mirrored, so I sprayed the inside. Lightly spray water on the side of object you'll be spray painting. The more water droplets there are the more "splotches" in the final result creating the mercury glass look. Immediately lightly spray paint the damp object. If you want a slightly transparent look, apply a thinner coat. I wanted a more covered look so I sprayed more. If you sprayed too much spray paint want to create more splotches, you can simply dampen a paper towel and gently rub the paint off. I'm obsessed with this stuff! It works so well and adds a nice touch to otherwise plain glass accessories. I want to do more for the holidays too. I didn't experiment with painting the outside instead of the inside of the vase, so if you do, let me know if it creates a different look. 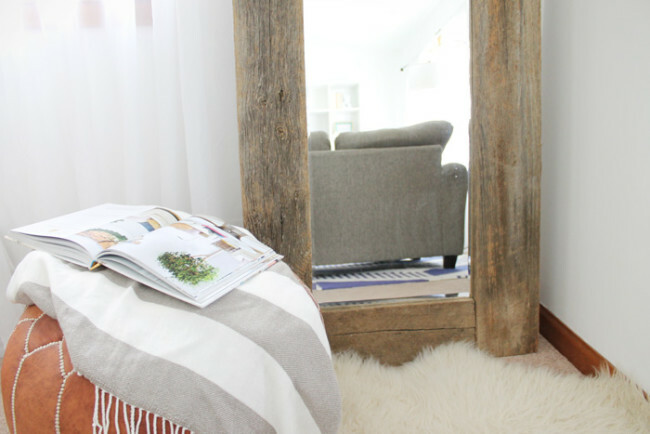 See more uses for mirror effect spray paint here. p.s. 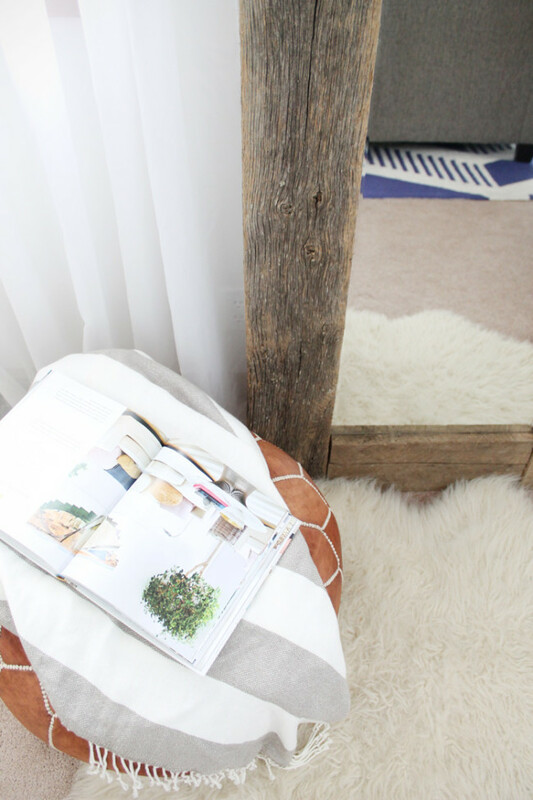 The Blogger Stylin' Home Tours are back with the fall refresh tours starting today! I'm SO excited to be participating this year so come back on Wednesday to see my complete fall home tour and check out the others too! Hi again! We had our first real taste of fall this past weekend with cooler temps and crisp air. Jordon and I went to a wedding on Saturday and it was such a perfect day. The venue was in a glass chapel that overlooked the fields (literally corn fields ha) and the reception was in an old barn that was renovated. It was so pretty! The past couple weeks I've been transitioning our decor and next week I'm sharing the full tour of our fall decorations. I have a few fall DIY projects that I'll post in the next few weeks as well so stay tuned! To take a little break before all the upcoming fall posts, I wanted to share our office makeover. Since Jordon first bought the house a year and a half ago the office has been the "storage" room. I hadn't touched it yet because I was focused on finishing the living room, bedroom, kitchen, and bathroom first. Now that those rooms are basically complete, I was finally able to move on to the office. First and foremost the office needed storage for my craft supplies, bills, and paperwork. I hunted for several weeks looking for the perfect shelves that fit the modern yet rustic feel I was going for. Most of the bookcases I found were great but the prices were so high, and when buying two I was not about to drop $400 or more. I ended up finding these cute industrial shelves on sale at Target. They're really sturdy and were easy to assemble too. The parsons desk I got a couple years ago from Overstock and the Eames knockoff chair is from Amazon. The blue tufted chair was a thrift find. Isn't it gorgeous?! I wasn't planning on getting a new chair for the office but when I saw it sitting in Goodwill in my traditional blue color AND in great condition, I couldn't pass it up. I'm obsessed! It really makes the whole room come together don't you think? For decor, I stocked up on storage baskets at Gordmans. Most of the other decor I already had except for the photo ledge shelf. Yes, those frames still have random families in them. I'm horrible about printing photos. Aren't these plants pretty? Plants are often forgotten about but I love adding them as decor for some texture and color. The only problem is I know VERY little about plants and what kind are low maintenance/least likely to kill. These guys are exotic angel plants from Costa Farms (available at Lowes, Walmart, and Home Depot) and are characterized as "medium" for sunlight. I water them about once a week and they're doing great! I threw the tag away so I don't remember the name of this green one, but the pretty purple one on the bookcase is a rex begonia. Be sure to stop by next week for the fall home tour series! It's shocking when I look back at photos of what the living room looked like before when we first moved in and compare it to now. What a difference. We made some progress and the last time I shared our living room last October it looked like this. Three coffee tables later...I love it so much more now! The living room is my favorite place in the house because it's so light and bright. In the mornings the amount of light that streams in the east windows is incredible. You can bet I sit right there on the couch and work away on my computer on weekends. When we first moved in, my inspiration for the house was modern nautical cottage. I love clean modern lines with blue accents and a touch of rustic/vintage. It's important the interior reflects the style of the home (1950's split level ranch) so I wanted the decor to fit the house, but still feel updated. You can see my inspiration post here. When I look back at the inspiration photos I think I did pretty good at taking bits and pieces from each one. It's funny -- sometimes I lean towards more modern and then a few months later I'll change and lean towards more vintage chic so I'm constantly tweaking things. The living room was the first room I tackled in the house though I still feel like it's a work in progress. Something still doesn't feel quite right, but I don't think I ever truly "finish" the decorating process. If you ask Jordon he will tell you about every couple months I get the itch to rearrange and switch around decor in the house. The room isn't huge and when we bought the sectional, it ended up being slightly too large for the space. We left the couch for several months, and then one day I decided to try rearranging and placed the two sectional pieces across from each other ( how they're pictured above). The room feels bigger and more open so I'm loving the new layout even though the sectional technically isn't meant to be split (one of the couches doesn't have an arm on one side). What do you think of the new layout? Most of the decor in our living room is thrift or I got it on major sale at Target or Hobby Lobby. The rug is from RugsUSA and it's always the first thing people comment on if I post a photo on Instagram. Sometimes I wish we had a more subtle, neutral rug but the blue is gorgeous and a good dose of color. 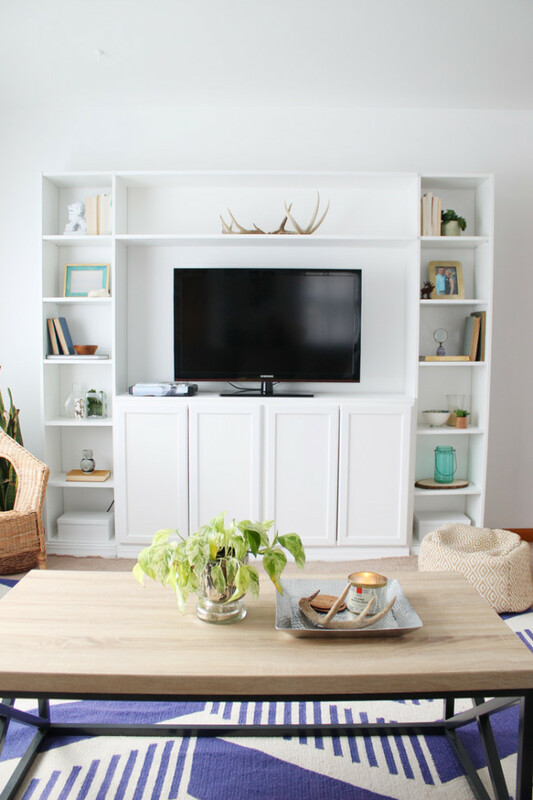 The TV stand is actually an IKEA hack where I took the Kallax shelving unit and super glued wooden dowels we cut and stained to the bottom to raise the height several inches. I found the coffee table on Craigslist for $50 and the chair is from IKEA. The blue credenza I found on Craigslist and painted it blue, but I'm contemplating painting it a different color. Thoughts? Let me know if there is anything specific you're wondering about. Unfortunately, most of the stuff I can't find online. Happy Monday! Thank you so much for all the love and support on my last post. You guys were so encouraging and gave me the hope that I can find a work x blog x life balance that is sustainable and I appreciate you sticking with me as I figure it out. Who else can't believe it's already August? The last couple weeks this month we're busy and then it'll be September so I'm trying to soak up the last of summer. While I'm not ready for cooler weather just yet, I am ready to decorate for fall. This is the first year we're living together in our home during fall so it's exciting that I have an entire house to decorate instead of an apartment. I walked into Hobby Lobby on Saturday and they are already stocked for fall and Christmas. I'm already planning decor ideas and will be giving a full home tour of it all. This past weekend I did a little work to the entryway. Our entryway is more of a big room instead of an entryway. It's an awkward space and size so I struggled with what to do so I ended up doing nothing. We needed a place to put our coats in the winter and I wanted the entryway to feel more homey as you entered the house instead of a random empty room. I found the bench on sale at Target and got the cute chalkboard hooks at Gordmans. We had some scrap wood laying around that I sanded and hung as a shelf. 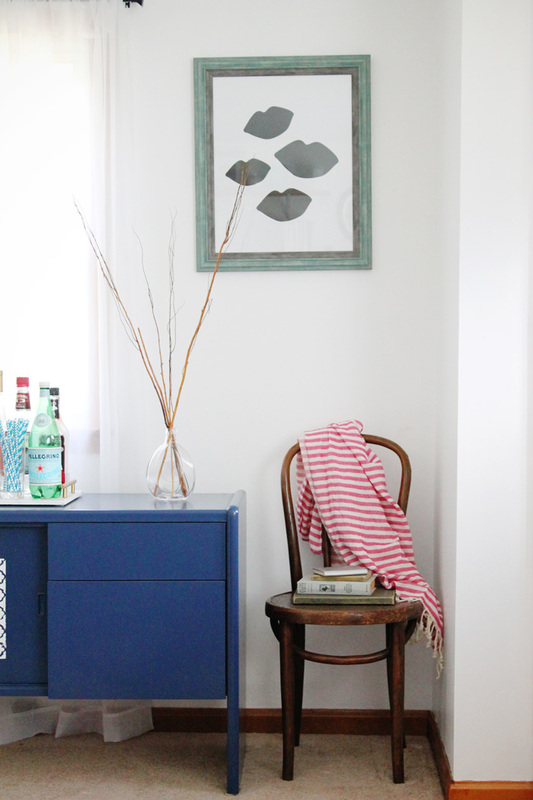 Just these few additions completely transformed the space into a functional entryway for under $100! Our home is a split level so the entryway is in the basement with one tiny window so you'll have the pardon the lighting in the photos. For reference, here's a photo that shows the size of the room. It extends even further to the right where our console table is, the doorway to laundry, and the stairs leading to the first floor. We had a randomly placed unused outlet so a little styling trick is to hang a scarf or jacket to cover it up. Another trick is to utilize closed storage for things like desktop computers. I have a personal and work laptop that I use but we have an old desktop computer and a printer that we still wanted to keep even though it's not used daily. It was sitting on an old desk but I wanted the computer out of sight. My parents had an unused armoire sitting in their basement and it happened to fit our computer perfectly, so we stuck it in there. The armoire stain looks rather yellow in the photos, but it's not quite that bright in person. I might try and "weather" it a bit so it looks more worn. So what do you think of the entryway? I love that just a few updates can change the look and function of a space! If I knew what really went into a bathroom renovation before we started, I may not have so eagerly volunteered to help, let alone do it ourselves. 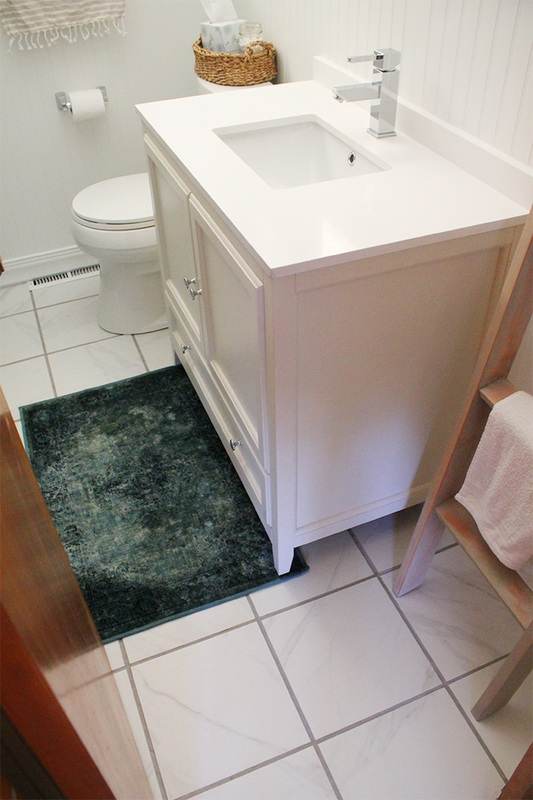 I was imaging a smooth process spanning two weeks, and then I would have my perfect bathroom. I'm not sure why I didn't know better after watching many Property Brothers episodes. We ran into several hiccups along the way but lo and behold, we are finished! Before we jump right in, let's back up for a second. My boyfriend Jordon bought his first home in March last year. I gradated college and moved to SF in May so we painted all the rooms before I left. A few months later we tore down the wallpaper, and did some other small updates here and there when I visited from SF. Then I moved back to Iowa with him in January and being the only bathroom in the house, I was in desperate need to update it. The bathroom was easily the worst room in the house, complete with cheap laminate floors, mismatched vanity and butterfly wallpaper. Cool. 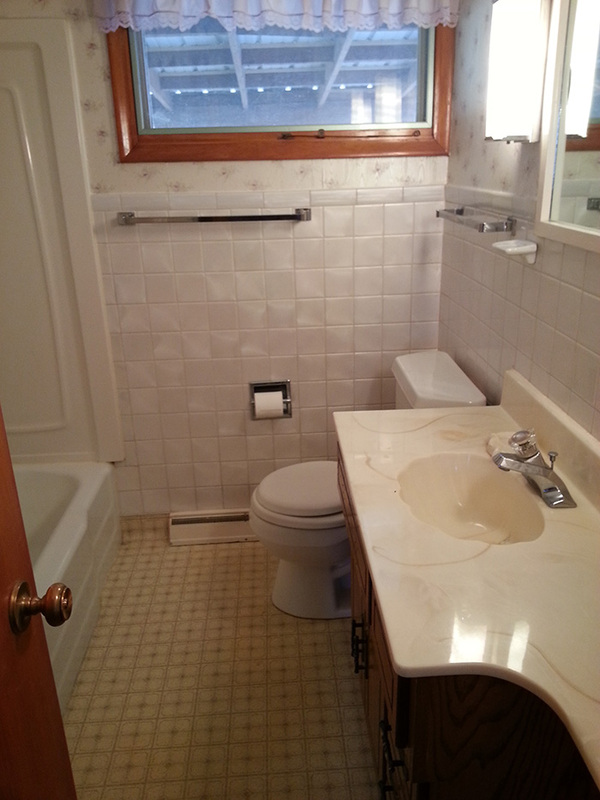 Here's what the bathroom looked like before. We kept putting off starting the bathroom renovation because neither Jordon or I had experience with it and it was intimidating. Jordon did lots of research so he knew what he was doing and we began renovation 5 weeks ago. It was a complete gut job and we put in all new everything without any hired help. So let's see what we did! He ripped up the old floor and we started laying the new marble tile from Build.com. Isn't it gorgeous? It's technically a porcelain tile with a marble look, but it was absolutely the best priced "marble" I found, and when I received it in the mail not a single piece was broke! Actually laying the tile was not a fun experience and once you start, you have to finish before the thin set hardens. Also, I had no idea that laying tile and then grouting it was two separate things. Ha. After the floor was finished we started on the subway tile in the shower. We spent a Friday night and all day Saturday putting up the tiles. I'm so happy we decided to go with an accent tile in the shower for some added color. Once all the shower tiles were finished (which took forever), things started to come together and look like a functioning bathroom. 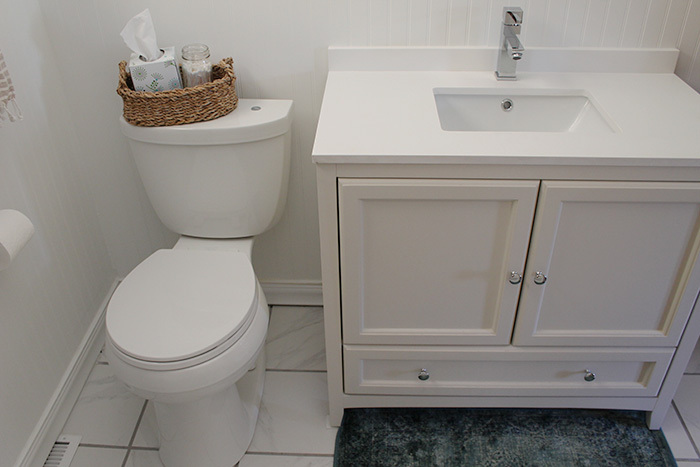 Next we installed a new Kohler touch-free toilet and DecorPlanet vanity. I'm sharing more pictures of the vanity later this week. I was leery of the touch-free toilet but so far it works well and we haven't had any issues. Instead of putting more tile on the walls where we took down the iridescent tile, we hung bead board and trim. It's so much cheaper than tile (about $40 instead of $200) and I like the cottagey look. Since the bathroom is tiny, I wanted to keep decor simple and clutter free. I found the ladder at Goodwill months back and was using it in our basement, but I wanted a cute way to hang our towels and it works perfect. The art above the toilet is an overhead beach shot I'm obsessed with. Let's see...what did I miss? If you have more questions about the renovation process let me know and I'm happy to go into more detail. 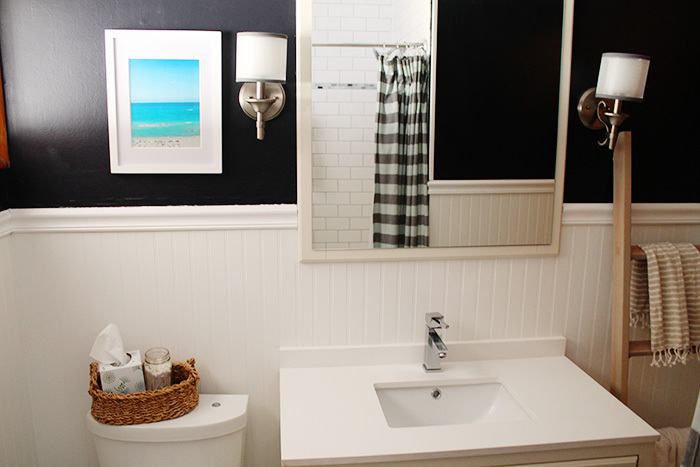 I can't tell you how good it feels to walk into a clean and bright bathroom! It makes getting ready more fun in the morning. 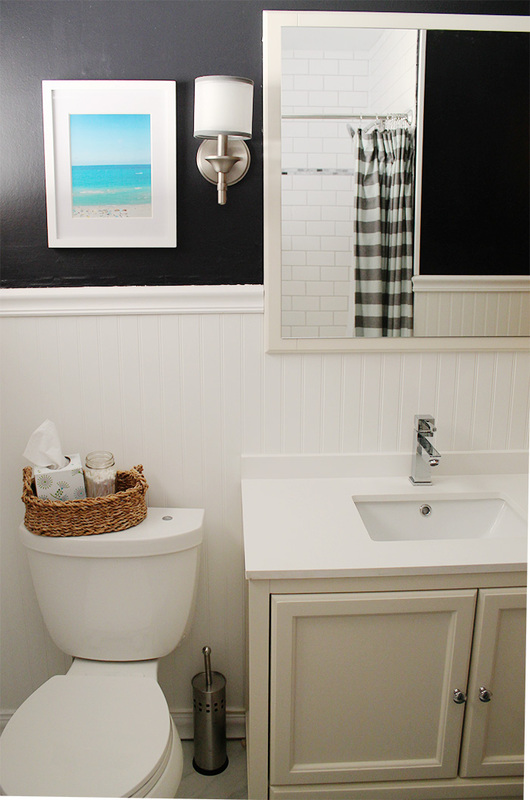 Be sure to check out phase two of the bathroom reveal for all the vanity and lighting details here!